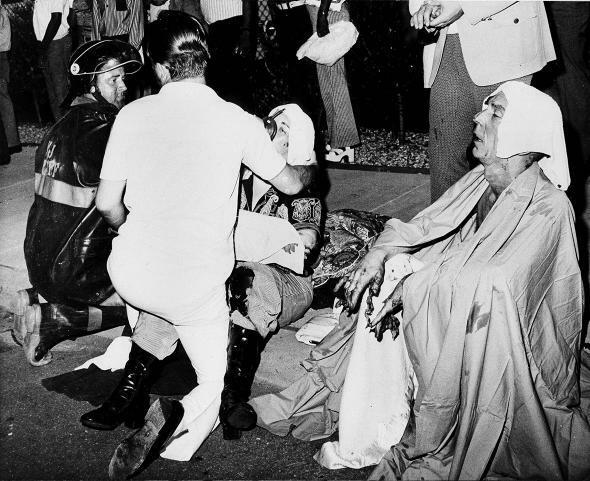 Pulse nightclub shooting and tragic history of violence at LGBTQ clubs in U.S.
Firemen give first aid to survivors of the UpStairs Lounge arson attack that left 32 dead and dozens injured on June 24, 1973, in New Orleans. The mass shooting at Orlando’s LGBT nightclub Pulse, which left at least 50 dead, is only the latest chapter in a long history of violence at LGBTQ bars and clubs in America. In fact, for as long as LGBTQ people have been congregating in their own social spaces, these spaces have been the target of vicious homophobic and transphobic violence. *Correction, June 12, 2016: This post originally misstated the name of the Seattle nightclub to which Masmari set fire. Read more in Slate about the Orlando shooting.